Nothing makes me happier than a GIANT plate of fried chicken. Especially if there are fries on the side. I indulge in fried chicken probably way more than I should, but I cannot get over how delicious it is. I mean, there’s a reason why every single culture out there has it’s own version. I definitely wouldn’t turn my nose up at Southern-style, Japanese (chicken katsu, toriten, karaage), Korean (triple-fried and either sweet or super spicy), Taiwanese (salt and pepper crispy popcorn bites)…I could go on, but I should probably stop before I get too hungry. But, now that I think about it, why are almost all the fried chickens I mentioned Asian? Do Asians just really really love fried chicken or is it just that I think of Asian chicken when I think of fried chicken? Are you guys fried chicken skin lovers or haters? We had a whole discussion about it at my grandma’s birthday party a couple of weeks ago. One of my cousins doesn’t like chicken skin. It’s not even that she thinks it’s not healthy, she just doesn’t like it – she gives it to her boyfriend and he eats all the skins. When I asked her why she liked fried chicken, she said that it was about the juiciness of the meat. 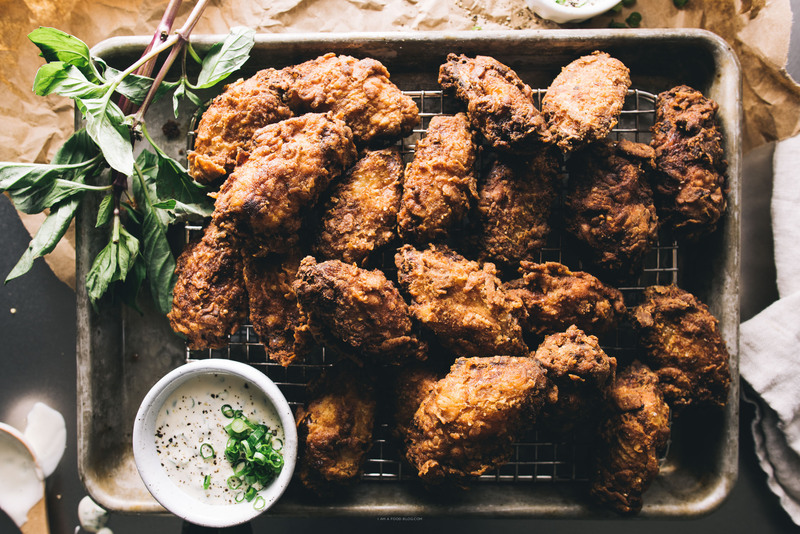 I mean, I get it, fried chicken is juicy, but really, it’s about the combo of crispy skin and juicy meat that gets me. Since I love juicy meat (heehee!) I ensured that these wings were extra juicy by brining them in buttermilk. 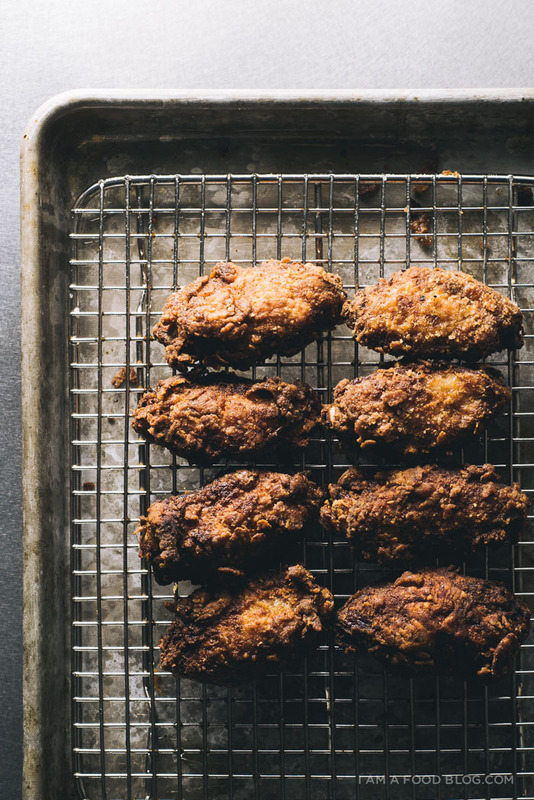 Some people think buttermilk doesn’t add much to the whole fried chicken package, but I really love the flavor of buttermilk fried chicken so I try to give my chicken a buttermilk bath when I have the time. 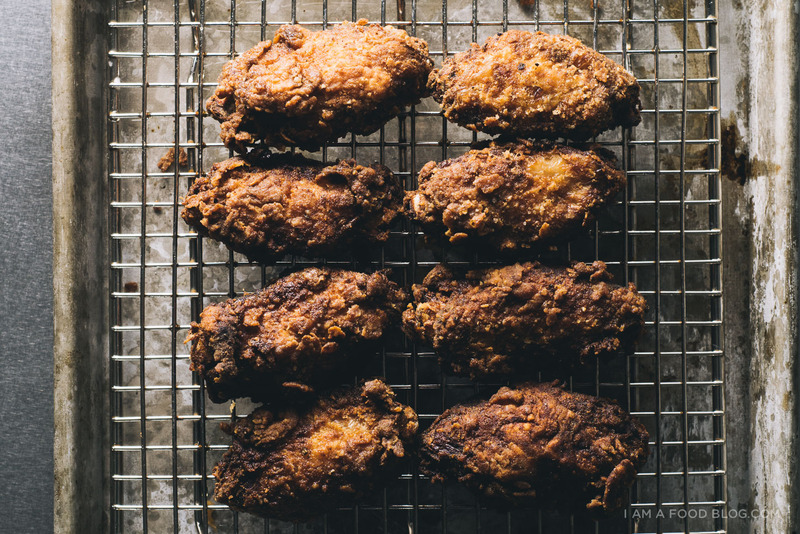 Plus, I think the buttermilk helps the flour coat more of the skin, giving the wings extra crunch, which is optimal. These wings were so shatteringly crisp and juicy that even after we said we’d stop two times, we managed to finish the entire batch, our hands greasy, our stomachs full, and our faces complete with chicken-wing eating grins. Dare I say that they were the best deep-fried wings I’ve ever made? I think so – they were damn good. I served them with some Thai basil and a slightly Asian ranch sauce. The basil added some freshness against the utterly burnished deep fried skins and the ranch was creamy and cool. 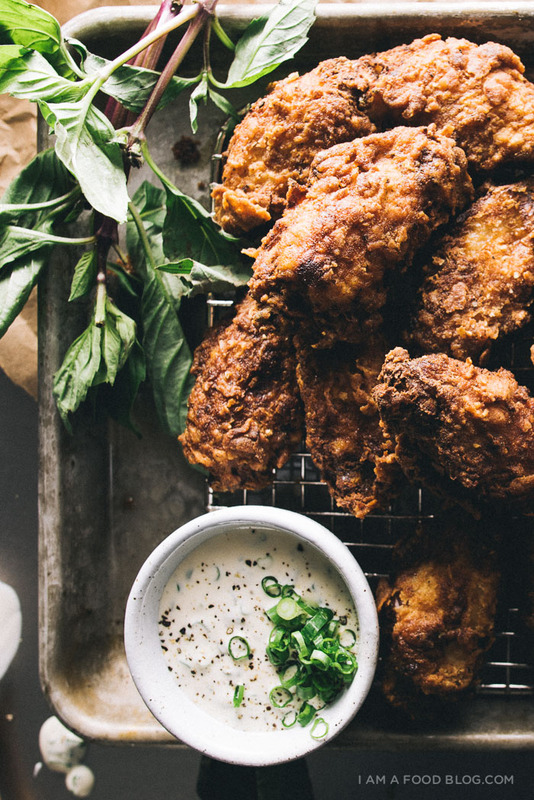 Buttermilk fried chicken wings: definitely a good thing. PS – I just started using my iPad in the kitchen. Before, when I cooked, I’d have my laptop on the counter, but the keyboard would get all sticky when I inevitably tried to make notes. Now that I’m using my iPad instead I just tell Siri to make notes for me instead of typing. It’s seriously awesome. I also use her as a giant oversized timer, which is totally over the top, I know. PPS – This isn’t sponsored. I just wanted to share the note taking thing! Whisk the buttermilk and salt together in a large container. Add the chicken wings soak for 4 hours minimum, or overnight. 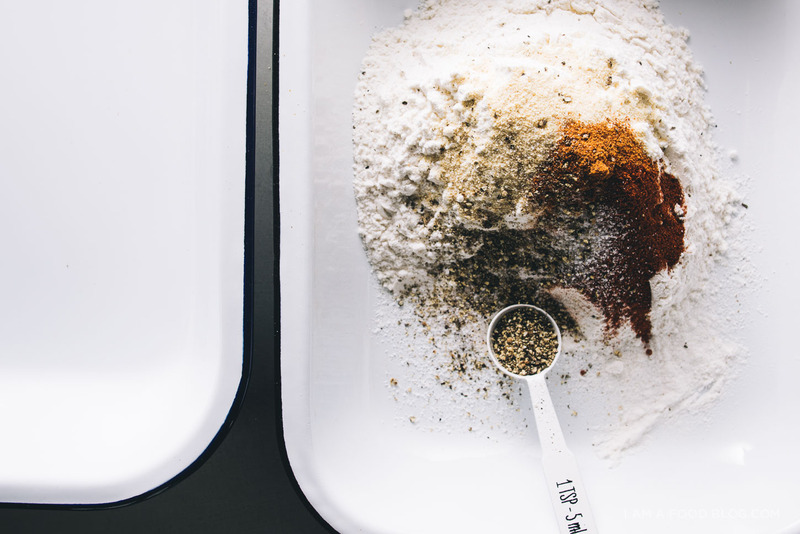 In a shallow container, whisk together the flour, garlic powder, paprika, cayenne, salt and pepper. Whisk in the two extra tablespoons of buttermilk to form large clumps – these are added extra crispy bits. Take a wing out of the buttermilk, shake gently, then coat in flour, pressing to ensure all sides are covered. Place on a tray and continue to coat all of the wings. Carefully add the coated wings to the hot oil and deep fry in batches, being careful not to crowd the pan. Flip occasionally as needed, until crunchy, brown and cooked through, 8-10 minutes. Let cool slightly and dig in with ranch and Thai basil. To make the dip: In a small bowl, mix all of the dip ingredients throughly. Season with salt and pepper to taste. Hmm- my favorite wings ever are these dried fried Chinese ones in SF (hence the thing about Asians craving fried chicken nonstop), but I do have a soft spot for the extra crispy chicken at KFC. And I love the sound of the scallion ranch dip- cold/creamy and hot/crunchy always pair so well together. These look super good! I love fried chicken skin, but my boyfriend doesn’t so I sometimes get his. No complaints here. That siri idea is so cool! Way better than getting loads of flour over the keyboard of the flour! I also love the juiciness of fried chicken but I can’t stand chicken skin like your cousin! Always end up giving it to my friends haha! Hnnngggg that chicken looks unreal. I am the queen of chicken skins and when I was a kid, I would actually take the skin off the whole roasted chicken before people were served. And ate it. I ate a whole chickens skin. Actually, that sounds hella creepy. Oooookay. First, your photos are stunning, as always. There’s something about that one shot with the slotted spoon (?) 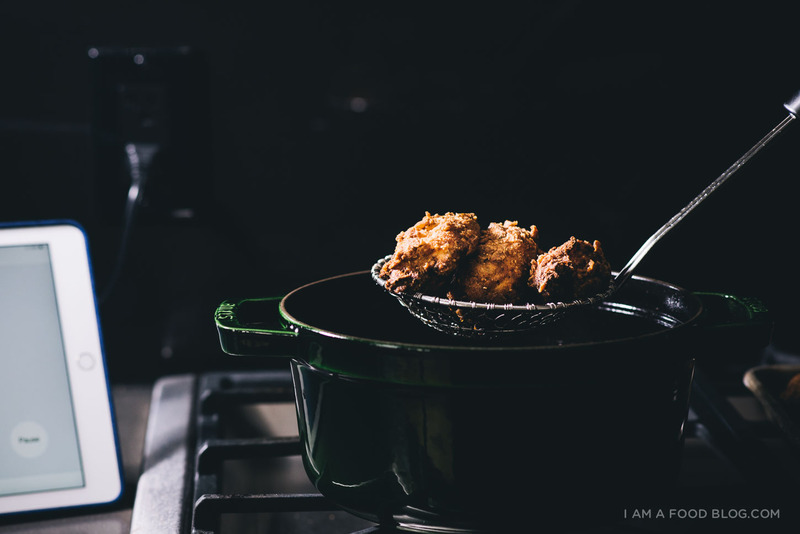 lifting the fried chicken out of the pop that is just magical. Then I read “shatteringly crisp and juicy” and I’m completely, utterly sold. Then you pushed it over the top with a scallion ranch dip? 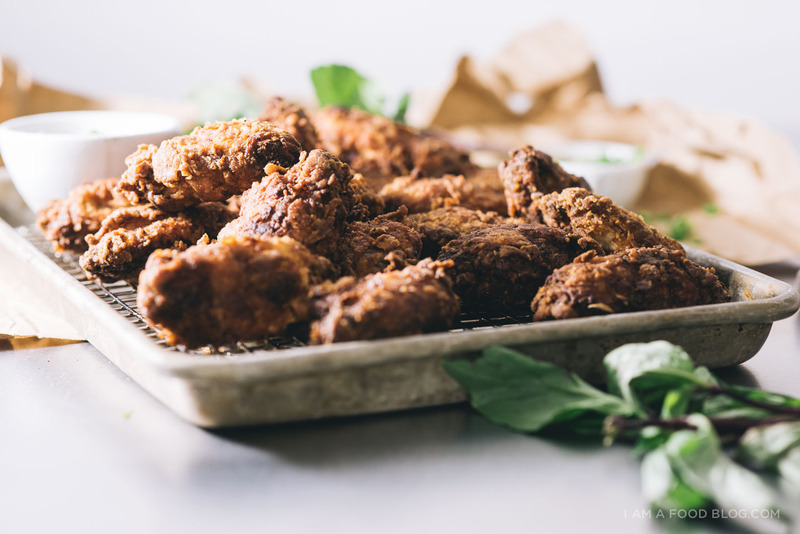 I’m also a fried chicken lover (especially love korean fried chicken – if you’re even in Boston let me take you to bonchon, where we’ll leave with our mouths numb but stomachs satisfied), so this variation looks simply delightful! Okay, this chicken looks amazing! I’m not even much of a meat person, but this – woah. This. is. amazing. 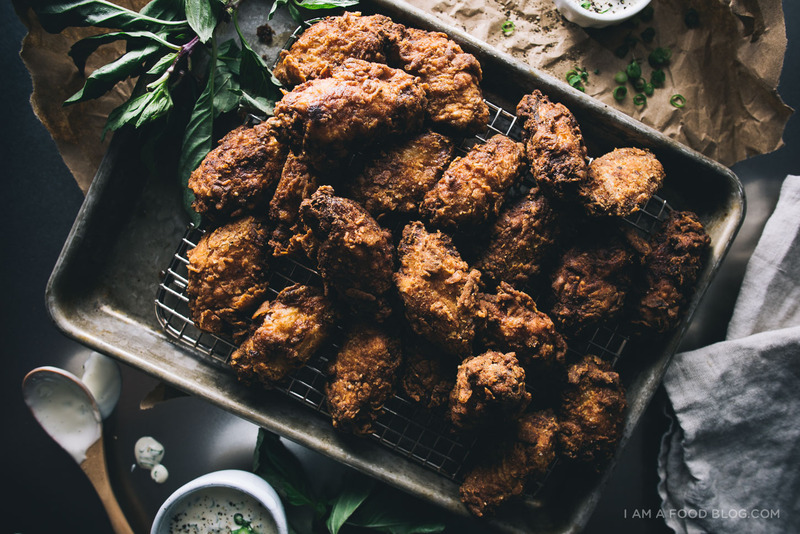 You know I’m so with you on Asian fried chicken, and I LOVE that you served this with Thai basil (and that scallion ranch dip, ahh)! Perfection. Also, using Siri as a “giant oversized timer” made me laugh out loud — I need to do this!! My laptop is perpetually covered in flour. I love all of this soso much, Steph! THESE LOOK AMAZE and hehehe loved the iPad, giant timer, Siri tip!! Wow! I’m always impressed with fried chicken-making. This looks absolutely mouthwatering. 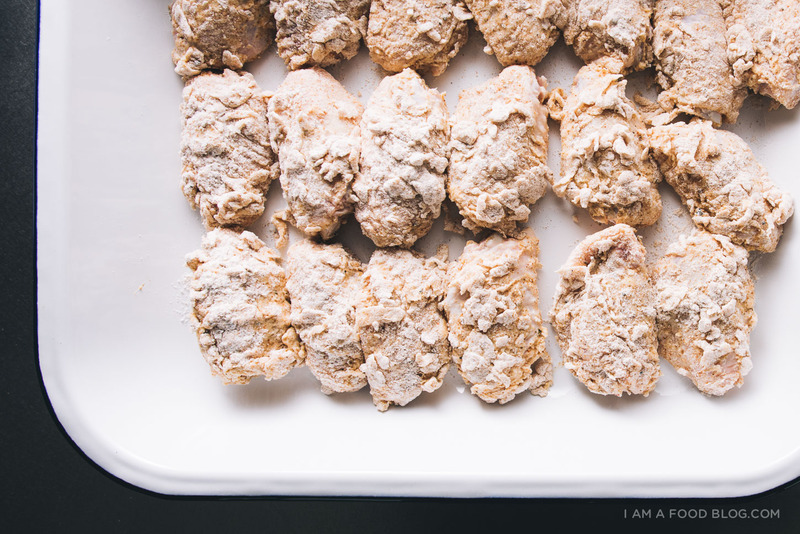 I love all your chicken recipes and have tried most of them – always awesome! Just did the recipe, the batter is wicked tasty. As is the scallion ranch. Problem for me happened when the batter cooked to quickly resulting in undercooked wings. Ended up finishing in the oven at 400 for another 35min. if your ipad is plugged in, all you do is say, “hey siri” and she’ll do whatever you ask. i’m always saying, “hey siri, make a note: …” you don’t have to get your ipad all grimy, so i LOVE it. This looks Amazing!!! 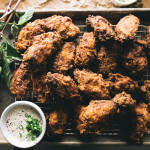 I love a good fried chicken and this recipe looks like a winner! These look like so~~~~~~~~very very hungry. My favorite food is chicken, Every dinner i am hungry i ate chicken. chicken is my live. gooooooooooooooooooooood food!!!!!!!!! I made these once for my son and his friends, and there is no going back – now I can’t get rid of his friends if they know wings are on the menu!!! Just whipped up a batch for our Superbowl party at home with the family and this recipe delivered. It is crunchy and well seasoned for this spice loving island girl. I will definitely make again and again. Thank you for posting!